Church leaders realized that the gospel needed to be translated, familiarized, and contextualized and that ministers, like Paul, had to become all things to all men so that they could by all means save some. Frederick Carnes Gilbert was born to Russian Jewish parents in London, England, on September 30, 1867. Born in Russia, Frederick’s parents were heavily persecuted by Christians in their country of birth, so they fled to Germany, only to encounter outright animosity from Christians. Virulent anti-Semitism forced the Gilberts from continental Europe. In England they found hope; an exciting era was opening for English Jews, for just months after Frederick’s birth Benjamin Disraeli became Britain’s first Jewish prime minister. Gilbert had a strict Jewish upbringing and was strident in his hatred for Christianity. He related that when he passed a Christian church he would spit in revulsion and recalls that on several occasions when he encountered Christians, homicidal fantasies pressed to the fore of his mind, his fingers itching to throttle them. Gilbert had somewhat of a turbulent childhood. With his father dying when Gilbert was an early teen, things were made even worse by his own poor health. Due to life-threatening asthma and lung disease, his physician recommended he sail to America, believing the climate there would be more conducive to his constitution. Gilbert was filled with trepidation at the thought of emigrating to America, for his father had warned him that it was a godless land. Nevertheless, he boarded the boat and sailed for New York City. Gilbert did indeed judge America to be godless. He found a factory job but was persecuted there because of his peculiar Jewish beliefs. Although he joined a labor union and paid his dues, he was fired with no recourse from a promising job. The young immigrant went from one employ to another, often walking the streets at night with no food and inadequate clothing, shivering from the cold. In hope for better prospects, the 21-year-old moved to Boston. There he obtained boarding with a Seventh-day Adventist family called the Fiskes. Initially intrigued by what he considered their bizarre fusion of Judaism and Christianity, he was ultimately won over by their lifestyle. He left the Fiske household two years later as a committed Seventh-day Adventist Christian. After Gilbert converted to Christianity in 1889, the tough times continued. His relatives, including his beloved mother, disowned him. Hatred was heaved on him more than ever at work and on the street. Employed at a shoe factory, Frederick quit to become a colporteur. After nine months of selling Adventist literature, he enrolled at nearby South Lancaster Academy, where he prepared himself for a ministry to all people, but with a special focus on reaching Jews. After college, however, Gilbert labored among the goyim (Gentiles) of New England for ten years. In 1896 he wed Ella Graham, to whom he was married for almost half a century. In 1898 he was ordained to the gospel ministry. 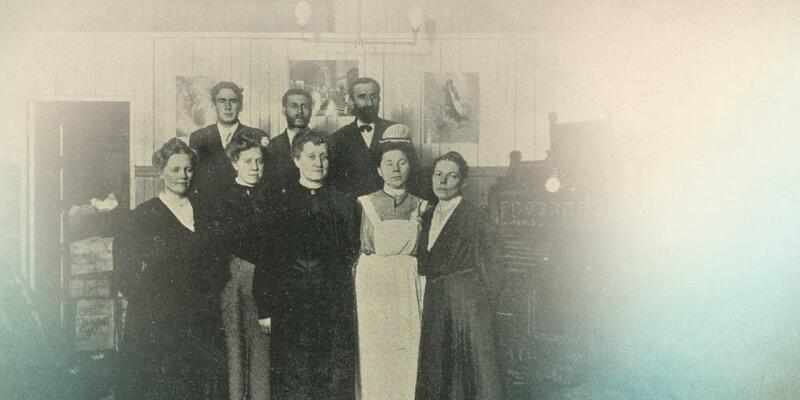 As the 20th century dawned, the rapidly growing Adventist Church was primed for reorganization, and new administrative structures were implemented from 1901 to 1903. Because of these dynamics, more deliberate methods of reaching people groups were being devised. Church leaders realized that the gospel needed to be translated, familiarized, and contextualized and that ministers, like Paul, had to become all things to all men so that they could by all means save some. Gilbert embodied this. It was in the first years of the 20th century that he launched an out-and-out campaign to reach the 300,000 Jews of New England. Each of his methods was undergirded by a hands-on and communitarian approach to evangelism, born out of a love for humanity. You could find him in the ghetto, conversing with rabbis, preaching in Yiddish on a soap box, canvassing from tenement to tenement, taking in orphans, caring for the sick, finding the unemployed jobs, and lobbying against Sunday laws, which threatened religious liberty for Jews. Gilbert established a refugee center for Jews who had no means of support, spoke in synagogues and halls, and started the gospel magazines The Good Tidings of the Messiah and The Messenger in Yiddish. True mission is always at a cost though. Gilbert was viciously accosted. He was the target of death threats and bottles filled with rocks. Sometimes his head was drenched in blood, other times his body was wracked with pain from pummeling. Yet all this he counted joy, to suffer for his Messiah. In 1913, once again at Gilbert’s behest, the North American Foreign Department established the Jewish Department Advisory Committee, Gilbert serving as superintendent. Five years later he became superintendent of the Jewish Advisory Committee at the General Conference. Advancing in age and no longer able to labor in the ghettos, Gilbert wrote books for Jews, showing the myriad similarities between Judaism and Adventism. His Christocentric masterpieces, Practical Lessons from the Experience of Israel, Messiah in His Sanctuary, and Judaism and Christianity present Jesus as the total realization of Hebrew cultural rites. Jesus outlined an evangelistic sequence to his disciples after His resurrection: “Ye shall be witnesses unto me both in Jerusalem, and in all Judaea, and in Samaria, and unto the uttermost part of the earth” (Acts 1:8). If Gilbert started in metaphorical Jerusalem, he then literally branched out to the uttermost parts of the earth. In 1922 as field secretary of the General Conference he employed his considerable energies on raising money and promoting foreign mission. He spent nine months evangelizing and growing the work in China and Japan, and a year in Western Asia and Europe. In 1939 he toured India, strengthening Adventists there, and then traveled to Central and South America in 1943. Totally taxed, his health collapsed, he had a severe stroke shortly after his Latin America trip. Frederick Carnes Gilbert died on August 31, 1946, just shy of 79 years old.